Located on the shores of Lake Llanquihue, Puerto Varas is one of the most beautiful cities in Chile. With a clear German influence, it has been a tourist city since its birth in the XIXth century. It offers a beautiful landscape, good hotel and gastronomic infrastructure, a modern casino, a lake beach, and several outdoor activities during the summer. O clima é mediterrâneo, quente no verão e frio no inverno. A temperatura média anual é de 13°C. A zona central do Chile é considerada a mais quente do país. No verão as temperaturas superam os 30°C. 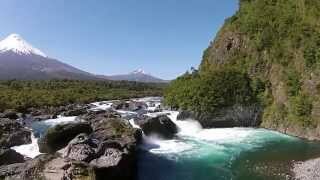 We will navigate Todos los Santos lake and cross the Andes mountains to reach the city of Bariloche in Argentina. .
Tourism in Puerto Varas: What excursions to carry out? Puerto Varas is considered one of the most beautiful cities in Chile, because it is surrounded by lakes, volcanoes and national parks.